Wanna take a ride on a 15-foot-long inflatable walking robot named Ant-Roach (as in anteater-cockroach)? 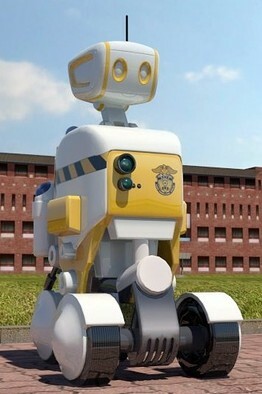 Um, maybe not, but hey, “human safe” bots are not a bad idea, especially if you plan to have one in your home, with kids. A future Disney attraction? 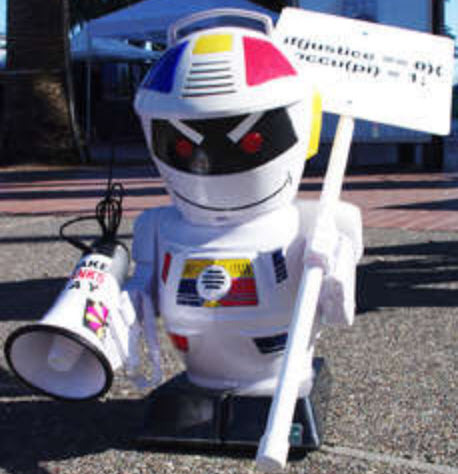 And then there’s OCCU(PI) Bot, carrying a sign that reads “if(justice) == 0 } occup(pi) = 1;” (get it?) — “the first in a promising line of tireless, unstoppable, robotic class warriors,” complete with a megaphone and optional Arduino — so you could, let’s say, control it via the Internet (“remote occupying”?). Hmm, I wonder if it’s pepper-spray-resistant? Speaking of anarchy, in case you believe the end of the world is nigh, The Guardian has compiled a doomsday list of “Strange ways to go” and their signs, such as: “If the Earth exists in a region of space known as a false vacuum, it could collapse into a lower-energy state at any point…. And New Scientist has its own list of cracks in reality, including the recent finding that mesons decay differently from their antimatter counterparts (that’s why we have more matter than antimatter), which would call into question the standard model of particle physics; and a now-accepted belief in the existence of multiple universes — maybe 10500 of them, or maybe an infinite number. The answer could be hiding in the cosmic microwave background, currently being mapped at higher precision by the European Space Agency’s Planck satellite. We now return you to our normal weird news.